Last week, Dan Sileo went on an unprovoked and extremely offensive Twitter rant against Erin Andrews. 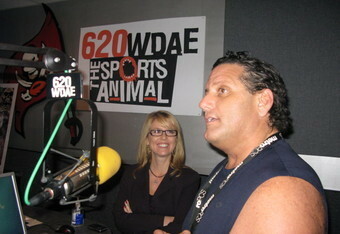 On Sunday, the Miami Herald reported that Sileo's employer WQAM has suspended Sileo for two days. While the station declined to comment on the suspension, it should come as no surprise to anyone, least of all Sileo. So the peephole comment was over the top, but not asking her to cook him dinner or bake him a cake? Every comment he made was incredibly sexist and over the top. He then goes on to call his suspension "classic." For what it's worth, Andrews has remained silent on the whole thing, and rightfully so. There's no need to pander to Sileo and she does have a career to focus on. If Sileo didn't change after calling African American NFL players "monkeys", it's hopeless to expect him to change for sexist comments to Erin Andrews. This is a process that will surely repeat itself until he's finally run out of second and third and fourth chances. 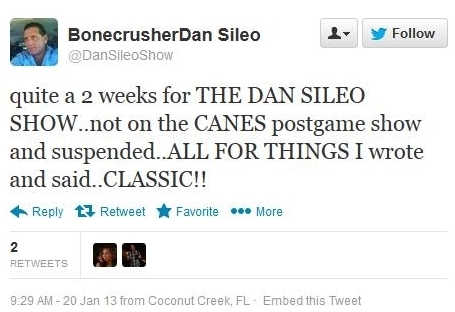 Maybe the mistake is expecting people like Dan Sileo to change when it's sports radio itself that needs to change.